Ideationizing: Can Google Cure our Poverty Ills? Can Google Cure our Poverty Ills? Here is an assignment I just wrote for my English 300 class. Yes, I currently live in Google, KS. Oddly I hadn't taken the whole thing very seriously until I wrote this paper. Funny how writing an English paper can make you think, even at my age. I think I am going to try to get it published in the school newspaper or maybe the local paper. Here on Washburn campus, it seems the internet is all around us. We've got complete Wi-Fi coverage in all the buildings and many of us have 3G wireless internet on our cell phones for when we walk outside. One may be prompted to ask, “So what's the big deal about this Google thing?” As many of you may know, for the month of March we no longer live in Topeka, KS. We now live in Google, KS (Hrenchir, 2010). At least till April Fool's Day. So, then, what is the big deal with this new ultra-high-speed internet service Google may or may not offer in our fair city? Why should any of us care? We've already got all the internet we could want and then some. Well, some of us care because of all the other people in town it could affect. You see, not everyone has access to the internet, especially not at a speed that is actually useful. This disparity has become known as the “Digital Divide.” Bharat Mehra, an assistant professor in the School of Information Sciences at the University of Tennessee who specializes in “the use of information and communication technologies to enable and empower communities to meet their needs and goals” (Mehra, n.d.) defines the “Digital Divide” as “the troubling gap between those who use […] the Internet and those who do not” (Mehra, Merkel, & Bishop, 2004, p. 782). In a report he co-wrote in 2001, Mehra went even further to say, “The digital divide is really a socioeconomic, cultural, and power divide that exists at both local and global levels” (Bishop, Bazzell, Mehra, & Smith, 2001). This troubling gap, as you will see, can have profound effects. You may not have noticed with all this “free” Wi-Fi flying around, but over the last decade or so that gap between the technology “haves” and the “have-nots” has been getting bigger rather than smaller. According to a 2004 report by the National Telecommunications and Information Administration (NITA), an agency in the U.S. Department of Commerce, in the decade before the report was issued this gap grew considerably, especially for children and the elderly. In fact, the gap grew by 25% when comparing those with the highest and lowest levels of education (National Telecommunication and Information Administration, 2004). This “gap” or “digital divide” didn't just occur in a vacuum, either. There are many who say the disparity between the technological haves and have-nots is directly related to the similar economic disparities within our society. Lisa J. Servon is one such person. Dr. Servon is Dean and Associate Professor at Milano, the New School for Management and Urban Policy at an innovative university in New York City called, simply, “The New School.” In her 2002 book Bridging the Digital Divide: Technology, Community, and Public Policy, she makes the case that this digital divide “is a symptom of a larger and more complex problem — the problem of persistent poverty and inequality” (2002, p. 2). So, like so many of our social problems, the availability of internet access is tied to poverty. But how so? Is the connection just coincidental? Or is it perhaps that the poor are simply not interested in the internet? Well, not according to the Social Science Research Council. In their report, Broadband Adoption in Low-Income Communities, commissioned by the FCC and just recently completed, none of low-income people they interviewed “needed to be convinced of the importance of Internet use or of the value of broadband adoption in the home” (Dailey, Bryne, Powell, Karaganis, & Chung, 2010, p. 15) The logical conclusion seems to be that those living in poverty have little access to the internet simply because they are poor. They don't have the money to afford the internet. But there is more to poverty than just money. Sure, it is easy to define poverty in strict financial terms. The US Census Bureau defines poverty for a family of four as earning below $21,834 (before taxes) (US Census Bureau, 2009). This income level — and similar numbers for families of other sizes and compositions — are bandied about so often that one could be excused for accepting the absolute measure of cash-money as the only way to determine poverty. However, sociologists have long used a different measure of poverty called “relative poverty.” As Richard Schaefer, author of Sociology Matters, a standard Sociology textbook here at Washburn, describes it, “relative poverty is a floating standard of deprivation by which people at the bottom of a society, whatever their lifestyles, are judged to be disadvantaged in comparison with the nation as a whole” (2008, p. 137). According to this definition, “poverty” can mean the lack of any resource that is widely available to others; even if that resource is access to the internet. Of course some may say, “Yeah, but the internet? Is that really so important that those without it could be considered to be 'in poverty'?” Again, our friends at the Social Science Research Council have an answer to our question. One of their primary conclusions in the afore-mentioned report is that “broadband access is increasingly a requirement of socio-economic inclusion” (Dailey et al., 2010, p. 3). If one is not included then one is necessarily excluded. This idea of inclusion and exclusion brings up the notion of social class. Weber used the term class to refer to a group of people who have a similar level of wealth and income. For example, certain workers in the United States support their families through minimum-wage jobs. According to Weber's definition, these wage earners constitute a class because they share the same economic position and fate (2008, p. 127). Max Weber thought that class was closely related to one's life with material goods, positive living conditions, and favorable life experiences (Gerth and Mills 1958). Life chances are reflected in such measures as housing, education, and health. Occupying a higher position in society improves a person's life chances and brings greater access to social rewards. Occupying a lower position forces a person to devote more energy and resources to the necessities of life (Schaefer, 2008, p. 140). Though Weber lived long before the information age, if he were alive today I am certain he would agree that access to the internet — with the access to important information it provides and the ability to communicate it facilitates — would count as one of those important “life chances.” This means there is an entire class of people who could be considered “impoverished” simply because they live on the wrong side of that digital divide. 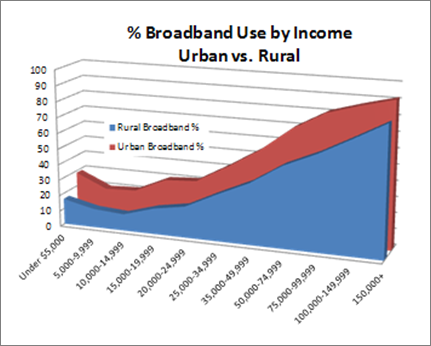 As you can see, there is a definite distinction between broadband use in rural and urban areas. The difference in proportions of those who have broadband is as high as 20% at some income levels. As a former independent computer consultant who provided services to both rural and urban customers, I can tell you that a large reason for this difference is the high cost of broadband out in those rural areas. Cable TV and DSL-based broadband usually don't reach very far outside of city limits in many areas. Users must resort to wireless or satellite-based services that usually cost at least twice as much for half the bandwidth, and the service is often pretty unreliable as well. In order to provide his business with truly fast and reliable broadband internet, one of my customers had to install a six-foot satellite dish and pay hundreds of dollars per month for the service. The highest disparity, though, is that related to income. As you can see, there is a staggering difference in usage rates between those at the lower income ranges and those at the upper end. In fact approximately five times as many households in the upper income range have broadband than those in the income range with the lowest usage. According to Terry T. Kidd, author of The Handbook of Research on Human Performance and Instructional Technology (a $600 dollar textbook, yikes!) and former Director of Instructional Development and Support Services at the University of Texas Health Science Center School of Public Health, “This trend indicates that those who have the means only become more information-rich, while those who are poor and of the working class, mostly those in the inner city/urban environments are lagging even further behind” (2009, p. 89). I guess the rich are getting richer and the poor getting poorer in more ways than one. At the World Summit, leaders from every country recognized the fundamental role that ICTs can play in promoting economic growth, social development and cohesion, as well as a sense of cultural identity. […] The ability to use ICTs is a key skill that increasingly determines the employability and standard of living of many citizens. Access to ICTs now drives access to information and knowledge, which, in turn, can decide access to wealth and affluence. A society in which a significant part of the population feels excluded from the benefits that ICT access brings is a society that is fundamentally insecure, at peril of social disintegration (International Telecommunication Union, 2007, p. 13). ICTs are an engine for economic growth in their own right. Economic poverty is directly related to information poverty (2007, p. 116). You can't get much clearer than that. Without access to broadband internet, it is difficult for those in lower income groups to get ahead. And when others do have access those others will be able to outpace their information impoverished fellow citizens at an even greater rate, thus effectively increasing the relative poverty of the poor. So, to sum up, poverty is a likely cause for dramatically low broadband accessibility, creating an entire class of information have-nots, in both our cities and in the country. And this lack of access then has a direct effect on increasing poverty within that class, in a cycle that — if not necessarily vicious — still needs to be broken. The leaders of the world agree. They even held a summit to address the issue. Google's ultra-high-speed internet experiment is just that, an experiment. No one knows what effect it will eventually have. Many who are vying for Google's attention seem to focus on the ultra-high-speed aspect of the service. Though some seem to believe that Google intends to connect everyone in the chosen cities to this 1,000 megabit connection, Google is merely planning to “offer service at a competitive price to at least 50,000, and potentially up to 500,000 people” (Google, 2010). As far as I can tell, that figure is all-total, across all of the chosen cities. That is not really very many people when you think about it. Therefore, the question again arises, “What is the big deal with this Google thing?” It certainly isn't going to instantly provide all the poor with broadband access. In fact, if as few as 10,000 people in the city get access to the service it could merely serve to make the digital divide even deeper. I believe the true effect of this “experiment” will not be a direct one. I believe, and hope, that the introduction of Google's ultra-high-speed internet service — even though few will be able to actually connect to it, let alone make any real use of all that extra bandwidth — will create competition in a market which I’m sure many in town will agree has been sorely lacking in competition for years. I hope that this competition will spur other internet service providers to build out their bandwidth to larger areas and offer higher speeds at more reasonable rates. This, then, will have an effect on the poor. By prodding all the other internet service providers to lower their rates, I hope Google's experiment will eventually improve the lives of the poor people of Topeka by giving them access to the information and communication abilities they need to get ahead. And that will be a big deal. Gerth, H. H., and C. Wright Mills. 1958. From Max Weber: Essays in Sociology. New York: Galaxy. cited in: Schaefer, R. T. (2008). Sociology Matters (3rd ed.). Boston: McGraw-Hill. International Telecommunication Union. (2007). World Information Society Report 2007 : Beyond WSIS (No. 2). Geneva: United Nations. Schaefer, R. T. (2008). Sociology Matters (3rd ed.). Boston: McGraw-Hill. Servon, L. (2002). Bridging the digital divide : technology, community, and public policy. Malden MA: Blackwell Pub. Wow, that was truly informative! I had no idea! Thanks for sharing this with us! Recent experiences with backup software.